This pillow resembles a standard envelope. It makes wonderful eye candy in any room but is exceptional in a den or office situation. Experiment with colors and piping to make the design details stand out. Your fabric could be measured and cut but since there are some angles, it is best to make the pattern on paper first. Draw one rectangle that is 13 1/2" by 17". Use the 13 1/2" edge as a straight grain line. This will be the front part of the pillow that is under the envelope flap. Draw a rectangle 10 1/2" by 17". Mark 3" from the bottom on both 10 1/2" sides. Find the center of the top 17" edge. Draw lines from the 3" mark to the center mark. Use the 3" edge as a straight grain line. This will be the lining piece for the flap of the pillow. Draw a rectangle 17" by 21 inches. Mark 7 1/2" down from the top on each 21" edge. Find the center of the 17" top edge. Draw a line from each side marking to the top center marking. Use the 13 1/2" edge as a straight grain line. This will be the back and flap piece. Use the final marked lines as the pattern pieces—The black lines in the diagram. Cut out one of each pattern piece. 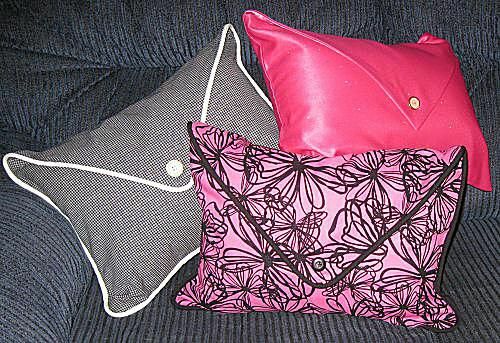 The facing can be cut out of a complimentary fabric if you are short on the pillow fabric. Note: All directions refer to a 1/2" seam allowance unless otherwise noted. Using a 1/2" seam allowance, sew piping to the edges of the back and flap piece. Clip the corners to allow the piping to lay flat on the fabric. Sew a straight row of stitching 1/4" from the edge of the fabric on the 17" edge. Turn under and press,so the wrong sides are touching, using the row of stitching as a fold line. Turn under again to enclose the raw edge. Sew a closely to the inside folded edge as possible to hold the hem in place on the flap. Sew a straight row of stitching 1/4" from the edge of the fabric on the top 17" edge. Sew a closely to the inside folded edge as possible to hold the hem in place on the inside of the front bottom panel. Lay the back and flap piece right side up on a flat surface. Lay the front bottom piece, right side down on top of the bottom of the back and flap piece, aligning the side and bottom edges. Lay the flap lining, right sides down on the top section of the back and flap, aligning the edges. Sew all the edges using a 1/2" seam allowance or following the stitch lines from the piping. Turn right sides out and press well. To hold the flap facing in place without having any stitching that shows, slip a strip of fusible web between the hem of the facing and body of the pillow cover. Use the iron to fuse the layers in place. Insert pillow form and close the flap over the front of the pillow. Sew a button in place to hold the flap closed.